The main aim was to assess agriculture soils differing in elapsed time since pumice mining in Mexico. The study sites in 0, 4, 10 and 15 year old reclaimed soils were compared with an adjacent undisturbed site. A general trend of recovery towards the undisturbed condition with reclamation age was found after disturbance. The multivariate analysis applied indicates that the most appropriate indicators to diagnose the quality of the soils were total N, urease and available phosphorus. 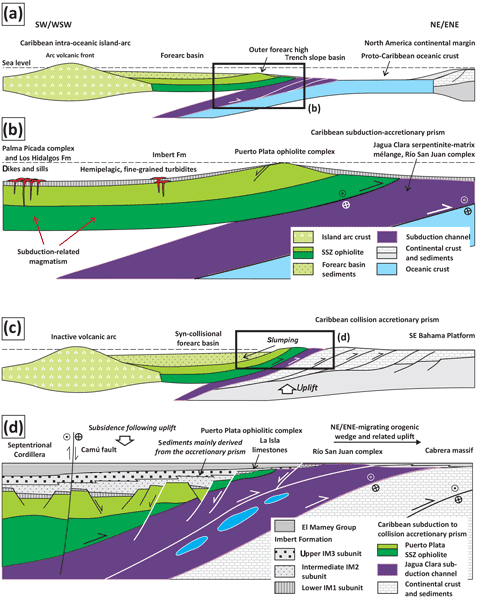 New stratigraphical, structural, geochemical, and geochronological data from the northern Caribbean orogenic belt indicate that the Imbert Fm constitutes a coarsening-upward stratigraphic sequence that records the transition of the sedimentation from a pre-collisional forearc to a syn-collisional piggy-back basin in the lower-to-middle Eocene. This piggy-back basin was transported to the top of the Puerto Plata ophiolitic slab as it was emplaced onto the North America continental margin units. The aim of this article is to describe and interpret qualitative and quantitative changes at the rock matrix scale of Cretaceous sandstones (northern Spain) exposed to supercritical CO2 and brine. Experimental CO2-rich brine injection was performed in a reactor chamber under realistic conditions of deep saline formations (P ≈ 7.8 MPa, T ≈ 38 °C and 24 h exposure time). SEM and optical microscopy, aided by optical image processing and chemical analyses were used to study the rock samples. Grazing increased diversity, but heavy grazing decreased aboveground biomass and increased the non-grass component. Overgrazing homogenized soil characteristics at a 10m scale. Therefore, moderate grazing was recommended as the preferred management alternative for grasslands in northern China because of increased plant diversity without negative consequences related to decreased forage quality forage quantity and soil heterogeneity in northern China's grasslands. 3D seismic and well data were used to study the evolution of salt pillows with extreme mechanical stratification to gain a better understanding of layered evaporite deposits. During evaporation an active basement graben caused the local accumulation of thick K-Mg salts. The resulting structure after the following extensional and compressional salt flow was strongly influenced by folding of the ruptured ZIII-AC stringer, leading to thickening and internal deformation of the soft K-Mg salt layers. We found a plausible relationship between crop yield and a land degradation index based on expert judgements and affected area share. A pseudo-experiment was designed that for sites with otherwise similar circumstances compares the yield of a site with and one without land degradation. Our overall conclusion is that yield reduction is associated with higher levels of land degradation, irrespective of whether fertilizer is being applied or not. Following the application of organic amendment treatments, the increased organic carbon and total porosity values, as compared to the control treatment, were greater in the loamy sand soil than in the clay loam soil. 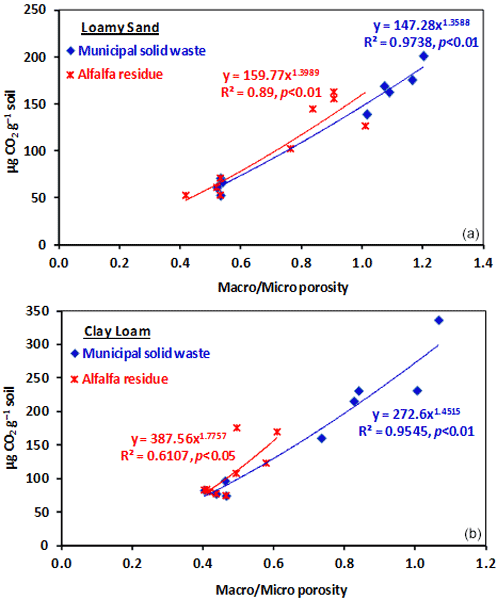 Moreover, compared to the microbial respiration of control plots, the application of municipal solid waste resulted in higher levels of microbial respiration from the clay loam soil than from the loamy sand soil, whereas the reverse was found for alfalfa residue. Rocky Mountain National Park is one of the most visited national parks in the United States. 95 % of the park is managed as wilderness. 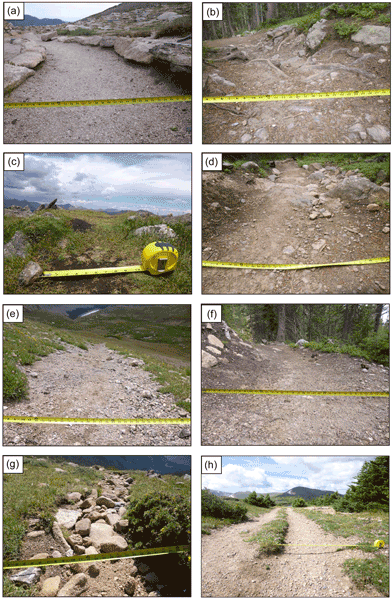 This paper examines the impacts of trampling on the vegetation and soil along selected trails. Trail widening and soil loss are the most visible types of trail degradation. Insights into the influence of different factors (use level, topography) can lead to the selection of appropriate management measures to avoid or minimize negative consequences. A new protocol for digital volume correlation facilitates detailed insights into internal deformation of soil. Structure deformation during centrifugation is revealed by comparing X-ray CT images before and after centrifugation. Quantitative image analysis reveals that soil structure changes are driven by soil shrinkage due to drying and soil compaction due to compression. 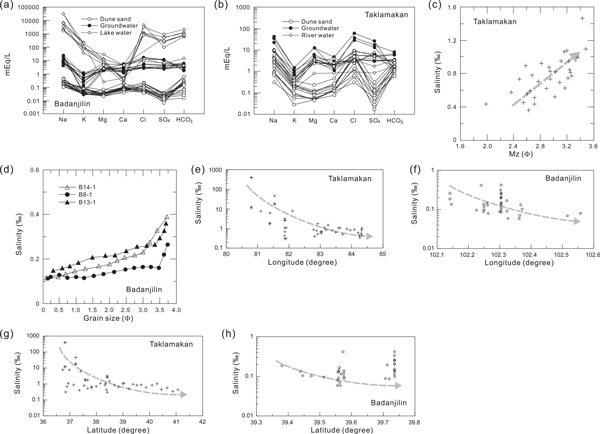 A study of vegetation restoration's effects on soil aggregate stability and SOC sequestration was carried out in a typical karst region (China). We found that revegetation promoted soil stability and accumulation of total SOC and SOC associated in water stable aggregates (WSA). WSA < 0.25 mm has the greatest contribution to total SOC. Fractal dimensions could objectively and comprehensively reflect soil stability. Promoting natural restoration is the ideal method to restore ecology in karst region. This study presents, for the first time, a characterisation of soil organic matter from the Gydan Peninsula in the Yamal Region, Western Siberia, Russia. We provide evidences that soils in this region accumulate lowly decomposed organic matter with a high mineralisation potential. This emphasises the vulnerability of this soil carbon pool to be remobilised as CO2 to the atmosphere under climate warming effects. We integrated fish-scale pits with mulching to test whether this integration could improve soil water conservation. The results showed that integrating fish-scale pits with mulching could conserve significantly more soil water by increasing infiltration and decreasing evaporation, and showed greater soil water storage and degree of soil water compensation compared to fish-scale pits alone. In addition, jujube branches exerted better mulching effects than maize straw. The application of a participatory approach towards sustainable solutions against the soil salinisation threat in arid environments is described. Three sustainable land management (SLM) technologies are evaluated using the WOCAT framework. This work presents considerations for the adoption of SLM practices and insights into the stakeholder preferences for the selection of available and new amelioration methods, and it hints on how a participatory learning process can raise awareness. This paper focuses on the record of lithospheric deformations within an intracratonic basin. This study is based on a detailed analysis of sedimentology and stratigraphy of the Paris Basin (European plate). We identified four intraplate deformations during the Palaeocene-early Eocene period. Age, amplitude, wavelength, and orientation of these deformations are specified and attributed to the geodynamic events. This paper is based on results from J. Briais Phd thesis. This study aims to present a comparison of the thermal gradient in the Earth mantle computed from full-scale geodynamic thermal models and from the thermodynamic description provided by the Joule-Thomson (JT) formulation. The main result is that the thermal gradient from the JT model is in good agreement with the full-scale geodynamic models and it is better suited than the isentropic (adiabatic reversible) thermal model to describe temperature variations in the planetary interiors. Phytotoxicity test was determined to assess ecotoxicity of landfill soil. Sinapis alba L. was used. Soil samples meet the limits for Co, Cd, Pb, and Zn specified in the legislation. An increase in plant biomass was observed in plants growing on soil samples, but no changes in appearance, slow growth, or necrotic lesions appeared. The tested soils reach high percentage values of germination capacity of seeds. Plant growth test can be good protocol to assess the phytotoxicity of landfill soil. The seismo-electromagnetic method is used for non-invasive subsurface exploration, showing interesting results for detecting fluids such as water, oil, gas, CO2, or ice, and to better characterize the subsurface in terms of porosity, permeability, and fractures. We describe theoretical background, the role of key parameters, recent theoretical and numerical developments, and field and laboratory observations to show that this method can bring advantages compared to classical geophysical method. In this paper we show how the shapes of irregular rock particles (pores) can be classified and quantified based on binary 3-D images. The methodology requires the measurement of basic 3-D particle descriptors and a shape classification that involves the similarity of artificial objects, which is based on main pore network detachments and 3-D sample sizes. The results were validated for three sandstones (S1, S2, and S3) from distinct reservoirs. Fixation pattern and kinetics of chelated and non-chelated Cu compounds in semiarid soils were examined. 22% more Cu was fixed in the non-chelated system within the first 14 days (difference of only 7% by day 90). The slope of change in Cu in respect to other nutrients was higher in the non-chelated system. Fixation of Cu was better described by the power function and second-order models in the non-chelated and chelated systems, respectively. Findings are vital for improved nutrient management.